(CNS): Staff, volunteers and board members at the Humane Society were all horrified Friday morning by the terrible condition of an emaciated and starving dog left in the charity's dog drop-off kennel. It is unknown whether the owners had taken the dog there overnight or whether a concerned member of the public, who may not have wanted to get involved, rescued the animal, which the society vet believed had been chained up for some time. Michelle Sabit, a director on the charity’s board, said the level of cruelty involved to keep a dog chained up without food or water until it had almost starved to death was unimaginable. The dog was taken to the vets for intense IV treatment and the Humane Society is appealing for donations and a foster home for the little brown mutt, which, with some care and attention, could still live. The vet explained that the dog's organs may have been impacted as it was evident the animal had gone without food or even water for many days. But with intravenous feeding and some care and attention he may make a full recovery. Sabit said she had serious concerns about the continuing level of cruelty and neglect the society was seeing, as she urged people to report abuse to the authorities as there are laws in place to prosecute people who either neglect or abuse animals. Despite the legislation, no one is able to say if anyone has ever been prosecuted, even though reports about significant acts of abuse and cruelty are routinely reported. However, the society is calling for action in the face of animal cruelty and for the authorities to enforce the law. In recent weekslocal activist Sandra Catron has also raised the issue about neglected and dangerous dogs. She has called for accountability from owners and for the police to act when owners are neglecting animals and when dogs become a danger. Catron eventually pressed the authorities to remove a dog from her neighbourhood in Newlands after her own pet was attacked four times by a dog that had become very dangerous. There was an animal control officer but no more! That person didn't do much of anything sad to say anyway so whats the point of having someone in that position if they don't do the job? Hope fully this new NCL will give some other departments powers to look at abuse & prosecute. I found a dead dog up in Bonnie View Estates by the water, it was mostly decomposed but still had a collar and a rope attached to it. It was just dumped on a piile of palm leaves. I would imagine it probably suffered the same way. Disguting the way animals are treated here. I must conclude there is something really wrong with the moral values when it comes to animals, dead or alive. I have put this to the test, again I might add. Four days ago, I witnessed a dead good size cat in the middle of the road right at the entrance of the airport fire station. On my way back, the cat was still there. Assuming it was someones pet nearby, I placed him in the grass strip at the house opposite the fire station so they would know the cat has been killed. This morning, the cat was still there however now in a pretty good state of decomposition and must be smelling up the place pretty good and yet, nobody has done anything to remove the carcass by nearly tripping over it for all the right reasons. If I witness a dead animal in a remote area, I would have taken it away and disposed of properly however this time I simply needed to prove a point and was really flabbergasted nobody has done anything. Pretty sure the cat is still there now for all to see. Next time and I'm sure there will be, I will remove the animal not only to prevent any possible disease such as botulism but also to prevent our valued tourist who pass by having to look at such a sight the moment they arrive on island and this dog being in his current state is most certainly no different when it comes to moral values. One can only hope there will be not be a next time this happens. Hopefully Teddy pulls through. I sure hope he is adopted and in a good home. After a tough start he deserves a break. Who is Teddy? There was no mention of the dog's name in the whole article, so is he YOUR dog then? hmmmm…. Teddy was the dog's name on Facebook. I am a dog lover / owner of 4 one from the society and one i rescued as a pup one I inherited as he loved me more than his owner and a pup just 5months old..But what i would like too know is Humane Society really going too waste money and keep him alive???? I would suggest take him out of his misery and suffering that would be thee most Humane thing too do right now as none of us know all what the dog went through…People please don't get me wrong!!!!!!! Well, we don't get you right! As a dog lover, why don't you make a donation for his care? Lots of other people have. (Now THAT's the most humane thing to do). You are worst than the person that did this to the dog. The hard heartedness of the person responsible for the condition of this dog beggers belief. Clearly the individual has psychological problems. The dog poisoners out there are equally psychologically disturbed. All the above have no empathy which leaves them less than fully human. Has anyone considered the fact that something may have happened to the owner,Perhaps he is in prison or worse;perhaps he is missing and not been reported as such. As a true born Caymanian please allow me to express my profound discuss at this negiience and wicked act bestowed to this poor dog. I grew up being thought "your dog is your best friend" and that is true, feed him well, take him to the sea, bathe him and give him a long walk. Then you have a friend for life who will protect you and your property. Someone made a comment regarding Caymanian culture and cruelty on animals. That is not fair to speak about our culture, for your information most born and bred "Caymanians" are passive and kind, and when we were growing up "our dog" and "our cat" was a part of our family, trust me when we ate they ate, when we went in the sea our dog went, and when we went miles away from home to cut thatch to make ropes for export to Honduras and Jamaica "our dog" went with us. I can remember as a child getting lost in Frank Sound land and my mother said just follow "Hero" and sure enough he brought us bck to the trail. I have a South African friend who worry when the current go off on her 2 dogs and 2 cats, these animals are family away from home to her and her busband. 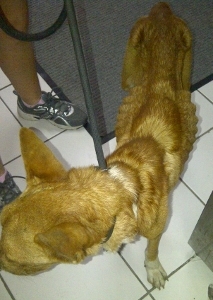 Oh, and by the way one of her dogs just have 3 legs she found abused and abandoned. Now, I understand Cayman has inherited over 150 different nationalities, bringing with them their culture and whatever, yet everythng that "bad" happens Caymanians are painted as criminals and bad people. I am so sick and tired when I hear some speak, some act, some drive, some push, some chat, and the list go on, yet they are "Caymanians" no they are not" and my God if you visit any country in the world and you are inclined to seek a grant or permission to stay in that country, for God's sake settle in and behave yourself and spread joy not unrest. I personally know we have many good foreign citizens in this country and I say to you "all" Keep up the good works, good results sure to follow. One day the tares with be divided from the wheat, may God hasen that day. And to all you animals abusers, redemption draw nigh, remember there is a penalty for injustic, the law of the land cannot serve the sentence that Judge above will certainly impose. Remember animals do have more sense than "some people" they marched in the ark for safety while the fools stayed outside and got drown. Tables are made for turning and I so hope someday the abuser(s) will receive the same fate that was dished out to this poor helpless dog. Food for thought! Besides this poor dog, special attention should be paid to the owner. Animal abuse often indicates serious aggressive behaviour to other humans. My guess is that whom ever neglected this poor animal would be far too lazy, irresponsible, self absorbed and cracked up to take it to the Humane Society. I hope this innocent pup finds a decent loving home to counter the stupid, senseless, and cruel treatment she has suffered. Every dog on the island should be tagged. If owners paid for dog tags, you'd see a decrease in strays dogs, and dogs being MISTREATED by their owners. There should also be officers that patrol the island to see if dogs are tied outside, and for how long. It's a shame that animals are treated this way. There is a special place in hell for you, Mr. Animal Abuser! Disgraceful! A country can be judged on the standard of politicians, the standard of driving and the standard of how they keep their animals. I guess we are basically screwed. 07.24 …. and the levels of littering and illegal dumping. "…no one is able to say if anyone has ever been prosecuted…"
Prosecurtion? Ain't gonna happen. Too many votes would be lost. You can tell a lot about a culture by looking at the way its animals are treated. Yup. Animals and the indentured slaves. The persons responsible for this dog are not sick. Sick can be cured. They are nasty, mean and vindictive with no heart. I sincerely hope they do not have children – I fear their children would not be treated much better. There are a number of welfares to whom the owners could have reached out to for help, but did not – they CHOSE to continue to treat this dog this way. God help this little dog to recover and forget. Since the Police have fundamentally failed to even attempt to enforce most of our laws for at least 25 years, WTF do we expect? I for one have given up even reporting crimes because they do nothing most of the time. That's the attitude! Wash your hands clean and blame others. Thanks for nothing. Actually no – I have personally sacrificed a great deal in support of law and order in Cayman, only to have it cause incredible damage to me and my family as a result of a failure by the authorities to act appropriately in the past. Once bitten, twice shy as they say…. There should be a mandatory spray/nueter program in place and enforced. If you own a dog.Fines should be a severe. There will some exceptions allowed. Then all stray dogs should be under a Veterinarian’s supervision be euthanasia at once. The population of dogs is out of control and required measures are needed. Agreed. Anyone who does this to a dog should be spayed ANDneutered! you mean we need a spray and neuter program for those women and men that keep making babies and can't afford to keep their pets much less their own kind! Thank you to whoever took him to the Humane Society dropbox, without you doing this, he would not have survived, if he does. Obviously the person who allowed him to get into his state would not have dropped him off. This is a message to people who see animals in distress, if you feel you cannot do anything else, take the animal to the Shelter, but otherwise call the Agricutural Department, the Police, the Humane Society, PAWS,Feline Friends and any other Agency. Remember that a person who treats a pet/animal cruelly often treats their chidren cruelly! Julie, I agree with you 100%. However, there are some people that would like to report animal abuse but are afraid to do so because of the type of people that are abusing the animals. In the past, I have fantasised about staking my neighbor out in the bush with a muddy pan of water and a few rotting table scraps to sustain him. Yeah, I know. It's illegal, but pretty to think about. I want to slap someone when I see pets with ribs showing. What in the world is wrong with these people that they could watch a helpless animal waste away — slowly dying — for the want of basic humane sustenance? It just kills me. How can we allow sucha tragedy to happen? I know that I will not allow it, and if it takes me getting thrown in jail, then that is the price for basic compassion which we all should have been born with. So… When are you going to stake out your neighbor and start slapping him? In reply;Submitted by Gut Check (not verified) on Fri, 21/02/2014 – 19:38. If you really have to slap someone then I suggest you slap the man in the mirror;that way you can avoid court charges or maybe avoid getting slapped down yourself. The same way they'll treat a dog is the same way they'll treat a human being. I eat cows, pigs, chickens, and I love to eat dog! Whaat are you talkin about???!!! Cameras at the drop off would be a good idea but then, people would hesitate to drop off animals in fear of being prosecuted!! There are high quality video cameras with recordinfg facilities covering the drop off box 24/7 and several other locations at the shelter. Why have the police not asked to review the recordings? oh yeh thats right too much like hard work and they dont give a sh#t. will the owner be charged? they should this is a crime. You've not been in Cayman long have you? You will learn. There are some sick people out there….why would you do that to your only true love friend! The poplution of dogs and cats are on the rise. Many owners just do not seem to understand the point of having an animal. If the public has not notice, there is a rise in dogs breeding, especially pit-bulls, bull dogs, and other breeds of dogs. Lets also mention, dog fighting? Athough I think that there should be something done about the population grow, in terms of a law that governers owners of dog, it could be impossible for there to be an effective law. Let see! People needs to be educated but this education on animals shoud not be left upon the Human Society or Vets on Island to for animals. Many days I see animals on the lose or being tied under a tree in the hot air. Chances are they do not get the attention they nees,they turn up their water or the get no water, some get food or some don't and if they do it may be tabe scraps. Dogs are like human-beings, they are not toys, they have vital organs just like us. The big question here is: Why be a dog owner if you can not take care of your pet? Unbelievable. But Ms Sabit, there is no point in our reporting the cruelty, especially if the perpetrators are Caymanian. Nothing – I'll repeat that – nothing ever gets done and you end up with the offending Caymanians (and by NO means are all offenders) bad-mouthing you and telling you to shake the sand from your feet etc. "The Authorities" cannot/will not even help with the stray dog problem and the "puppy mill" problem. We are part time residents and have been coming over for over 20 years and just can't believe the way many local people treat their dogs. As you say, why oh why do they have them when they either can't be bothered to exercise them and wonder why they turn aggresive. In the UK we have the RSPCA and they are very proactive in removing dogs from poor environments!!. This is another area where the Government have NO teeth!!!! * do we need government for everything?! The RSPCA (Royal Society Protection Cruelty to Animals) is a Registered Charity, not funded by Government, but by public donations and fundraising. I hope they find the owner and I hope they are subjected to the same cruelty. What a disgrace that person is!! This truly is sad. Luckily for this dog, he may have a chance at survival but one has to ask how many other dogs are left on chains in yards until they die? 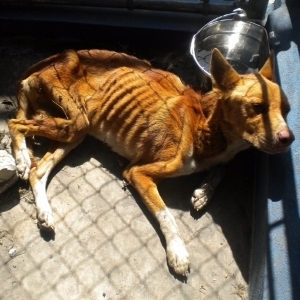 Something really needs to be done about animal cruelty and neglect on this island. To:Submitted by Anonymous (not verified) on Fri, 21/02/2014 – 20:13. If you hate it here so much ,why don't you move on? Or does your wife force you to stay? Alden, where are the animal protection laws? "you've not been in Cayman long have you"
The laws are there in place fully ratified by the LA and along with many many other laws completely un-enforced. Maybe an FOI to the DOA would give some answers but then again I could hazard a pretyy good guess what would happen there as well !!!!!! New laws will not solve any problems on Cayman. Enforcement of the existing laws would help enormously. Unfortunately, ………. most of you readers get the picture. What is the appropiate karma for someone who would treat an animal in such a fashion? I think the responce should be to starve him until he looks like his dog!! This makes me sick to my stomach. What does all this cruelty to animals say about our society? Come on everyone, let's all make a donation to help this little guy.